Spur Cross to Go John! 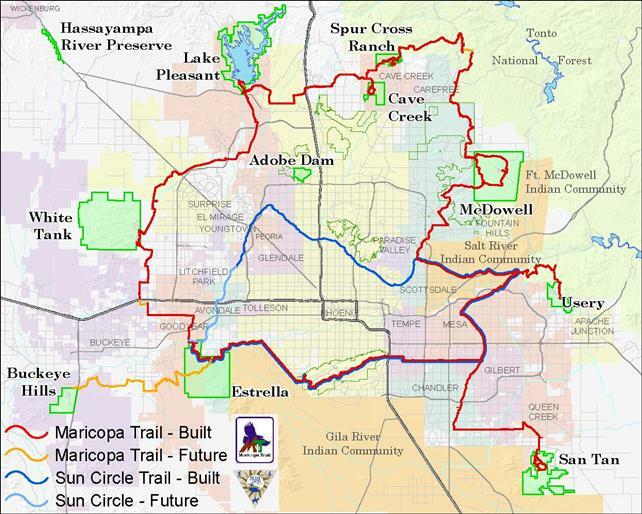 When completed, the Maricopa Trail will be a 242-mile loop encircling the county, connecting 9 of 10 MCPR parks. Roughly three years in the making, about 80 miles have been completed as of November 2009. Completion is planned within the next 5 years. Sections of the Arizona Trail and Maricopa Trail on Arizona State Trust land were purchased as perpetual rights of way. Recreation permits are not required on these trails unless you leave the width of the trail. This hike describes Segment 19, 18, and 17, from the Spur Cross Ranch Conservation Area south-west to Cave Creek Recreation Area. The Spur Cross Trail (Segment 19), one of the earlier fragments of the Maricopa Trail to be completed, was recognized with an Environmental Excellence Award of Merit by Valley Forward. When I hiked it with 15 members of the Friends Hiking Club in April 2010, the area was lush, green, and covered with desert flowers. There is no water along the trail, so bring plenty. Maricopa Trail Segment 19 begins in the Spur Cross Ranch Conservation Area and follows the well marked Spur Cross Trail west for 4.2 miles along the southern base of Elephant Mountain. Gradually gaining 450 feet, the trail crosses several washes until it reaches the park boundary, marked by a barbed wire gate. Once through the gate, the trail enters the Tonto National Forest, and becomes Segment 18. The next 2 miles is fairly level as it follows old dirt roads south and west, offering excellent views of the surrounding areas of Cave Creek and Desert Hills. At this point, the trail turns south for .3 miles, jogs right though a cattle guard, then continues south another mile. Here one has the option of turning west on Maricopa Trail Segment 16 for 6 miles to the Anthem trailhead, or east 1.2 miles on Segment 17, which turns south and enters the Cave Creek Recreation Area at the Go John Trail. Continue south on the Go John Trail for 1.3 miles to the CCRA trailhead, for a total of 10 miles. Directions to Spur Cross Ranch Conservation Area trailhead: I-17 north to the Carefree Highway exit 233. Head east on Carefree Highway 9.9 miles to Cave Creek Road. Head North on Cave Creek Road 2.5 miles to Spur Cross Ranch Road. Turn north for approximately 4.5 miles to the public parking area. After 3 miles the road turns to all-weather graded. The last 1.5 miles can be confusing; continue north on the graded road past the green house, through the tall gateposts and on past the horse corrals to the signed public parking area on the right. There is a $3 per person a entry fee. Directions to Cave Creek Recreation Area trailhead: Take 17 North to the Carefree Highway exit 223. Head east on Carefree Highway to 32nc Street. Turn north on 32nd Street 1.5 miles to the to the park entrance. There is a $6 per car entry fee.